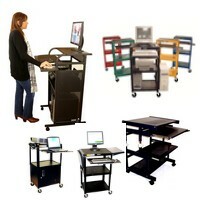 This category includes metal computer carts, metal computer desks, steel computer stands, computer cabinets. This is 100% metal computer furniture. Our new line of compact computer carts is 100% made of steel, powder coated in saton black paint. Sturdy, durable, compact and portable. Used in all environments: office, school, industry, medical centers, home-office. Includes rolling sit and standing computer desks & carts, as well as height adjustable computer carts and fixed wall-computer workstations. We also offer our exclusive downview metal-glass computer desks. Please scroll down to see our metal computer office furniture. Then click on the image or text next to the image, for full information on the item.